the eighth wonder of the world at one stage) is by Matthäus Merian. 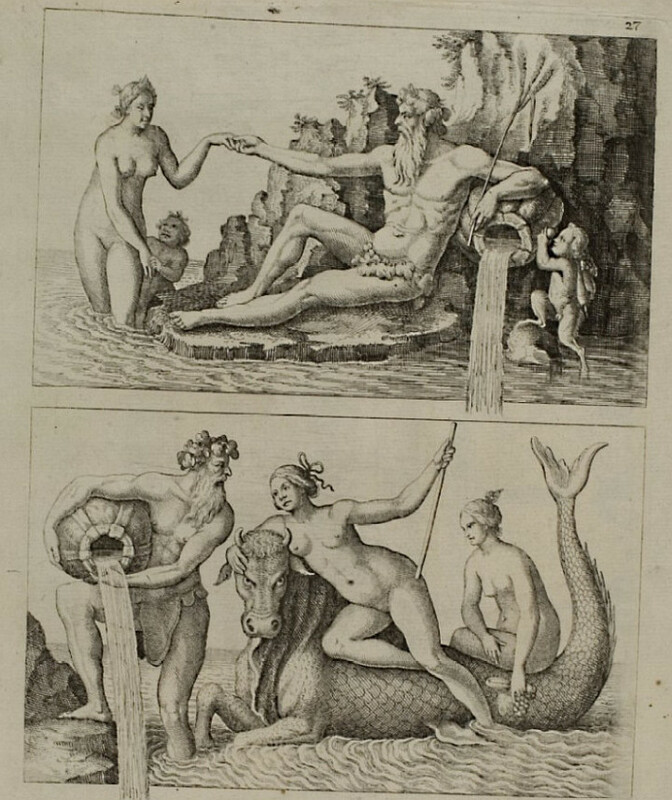 A painting based on Merian's engraving, by Jacques Foucières. This photo is a recent vague approximation of the same view. 1815 painting by Carl Philipp Fohr. "Out of a billowy upheaval of vivid green foliage, a rifle-shot removed, rises the huge ruin of Heidelberg Castle, with empty window arches, ivy-mailed battlements, moldering towers—the Lear of inanimate nature—deserted, discrowned, beaten by the storms, but royal still, and beautiful. It is a fine sight to see the evening sunlight suddenly strike the leafy declivity at the Castle's base and dash up it and drench it as with a luminous spray, while the adjacent groves are in deep shadow. Behind the Castle swells a great dome-shaped hill, forest-clad, and beyond that a nobler and loftier one. The Castle looks down upon the compact brown-roofed town; and from the town two picturesque old bridges span the river. Now the view broadens; through the gateway of the sentinel headlands you gaze out over the wide Rhine plain, which stretches away, softly and richly tinted, grows gradually and dreamily indistinct, and finally melts imperceptibly into the remote horizon. Heidelberg Schloss (castle) is perched on a steep slope 80 metres above the Necker river in south west Germany. Sometime around the end of the 14th century, Prince Elector Ruprecht III built a Royal residence on the site and construction continuted intermittently for the next 400 years. 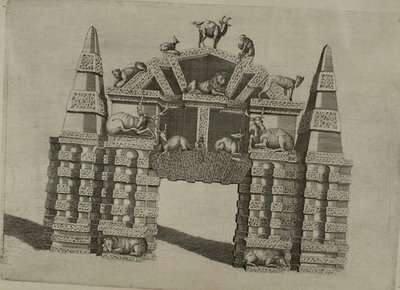 Consequently the palace, which evolved into a fort and then into a castle, contains medieval, baroque, renaissance and gothic architectural elements among its remaining structures. 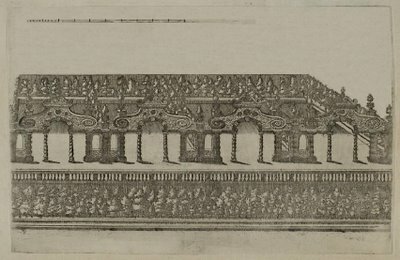 The most significant building work was carried out in the 16th and 17th centuries, beginning (allegedly) with the transfer of columns to the site from a palace that had belonged to Charlemagne. 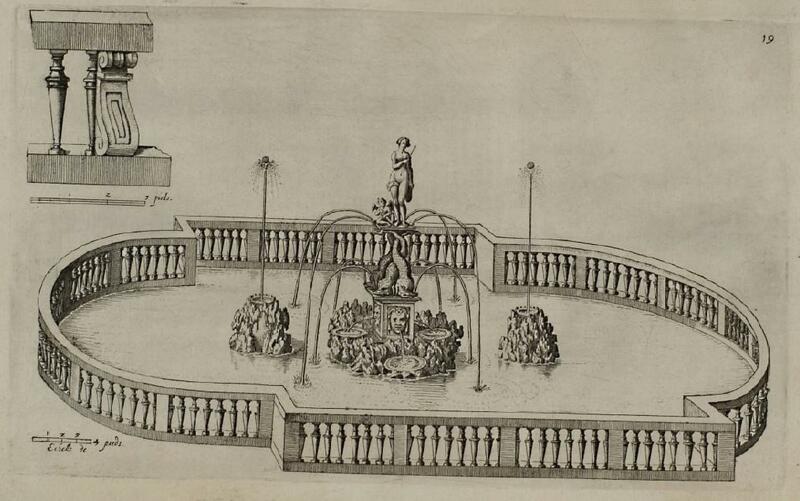 But it was during the time of Prince Elector (and briefly, King) Frederick V that construction of the famed Schlossgarten (castle garden) was undertaken. Salomon de Caus (1576-1626) was a french Huguenot exile who trained primarily as an architect and mathematician. 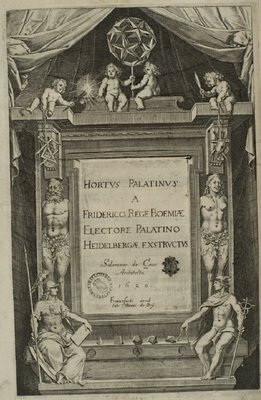 His vocational output extended to geometry, astronomy/astrology and music but he developed into an hydraulic engineer after spending time in Florence with Bernardo Buontalenti at Pratolino at the end of the 16th century. 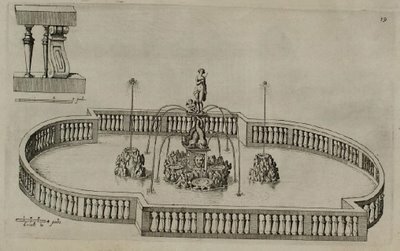 De Caus began designing wells, fountains and hydraulic automata in Belgium and then went to England in the service of the Prince of Wales. He completed several garden designs (some included in his 1612 book, 'La Perspective, Avec la Raison des Ombres et Miroirs') between educating the royal household in drawing techniques. 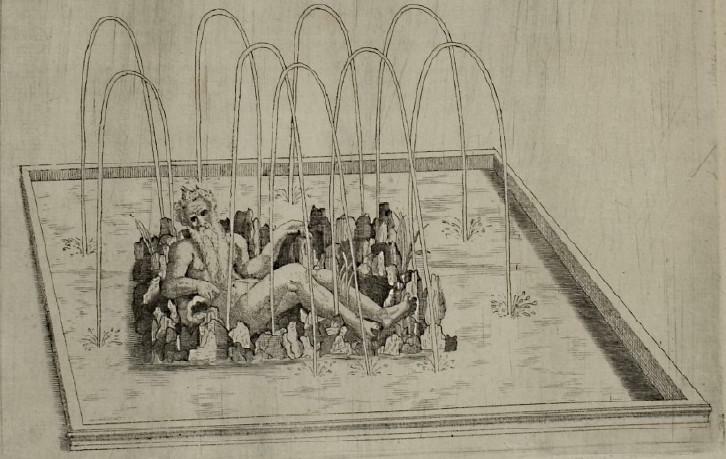 His interest in waterworks expanded with trick fountains and elaborate ornamental water feature commissions, in which de Caus played a pivotal role in spreading the thematic elements of italian renaissance garden design to northern Europe. 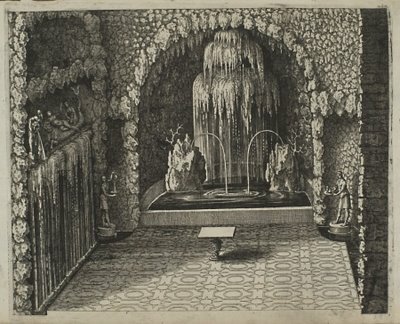 De Caus spent 5 years designing and constructing the renowned hortus palatinus (palace garden) for the Prince Elector, which included grotto features and more of his elaborate water sculptures among the mannerist terrace layout. 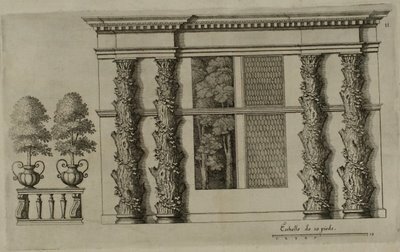 But the construction was never completed due to the interruption by the 30 year war which saw the 'winter King' Frederick flee the country. The garden and palace buildings were greatly damaged - not for the first or last time. 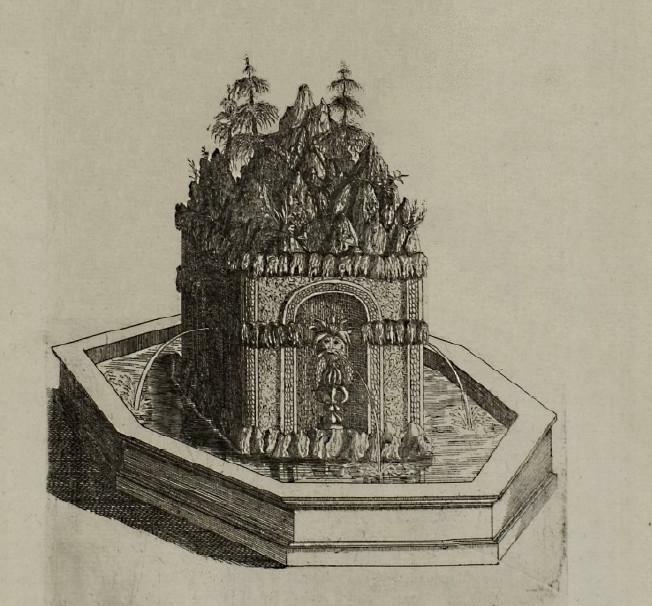 Lightning strikes in the 16th and 18th centuries and various wars all contributed to the deterioration of the site, despite intermittent attempts at reconstruction. In the modern era, restoration of the central building was carried out at the beginning of the 20th century and vestiges of de Caus's garden motifs and the remains of the palace ruins are now preserved. 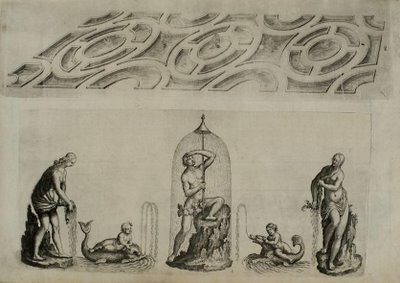 As war broke out de Caus returned to France and his Schlossgarten plans were published by Theodore de Bry in Frankfurt as 'Hortus Palatinus' in 1620. 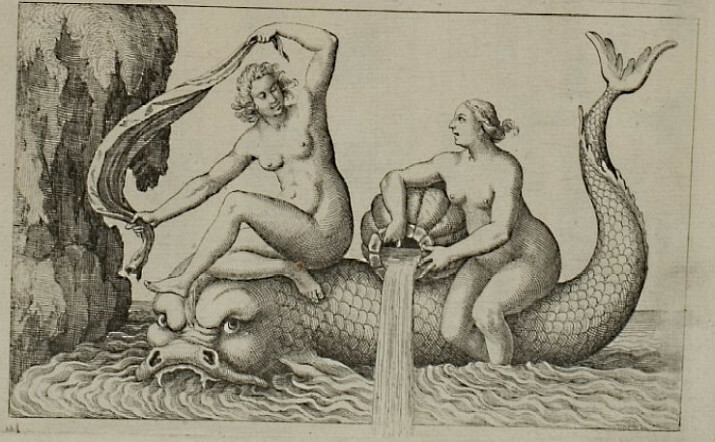 The book, which includes 30 engravings (and I venture to guess that not all of them were by Matthäus Merian) is online at the University of Heidelberg. 1I got quite confused trying to work out which illustrations belonged to Merian and just when (see for instance) they were engraved. 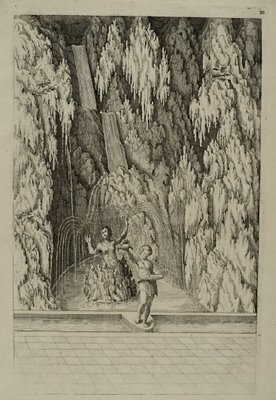 This polygraphicum site (1/3 of the way down) has quite a few different illustrations and paintings of the castle, including three that appear to be by Merian (or are copies) - I believe that on the opposite side of the Necker river to the castle there is an area or a plaque dedicated to Merian, from where one of his illustrations - another of the famous renderings, with banners at the top of the picture - is said to have been made. 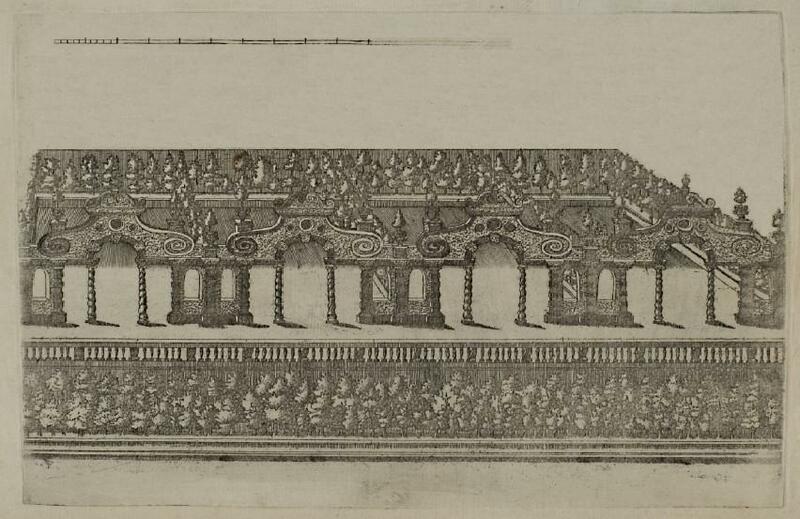 Heidelberg Palace at Schloesser Magazin. A recent photograph of the castle and grounds from the air. There are many, many photographs of Heidelberg Schlossgarten at flickr. 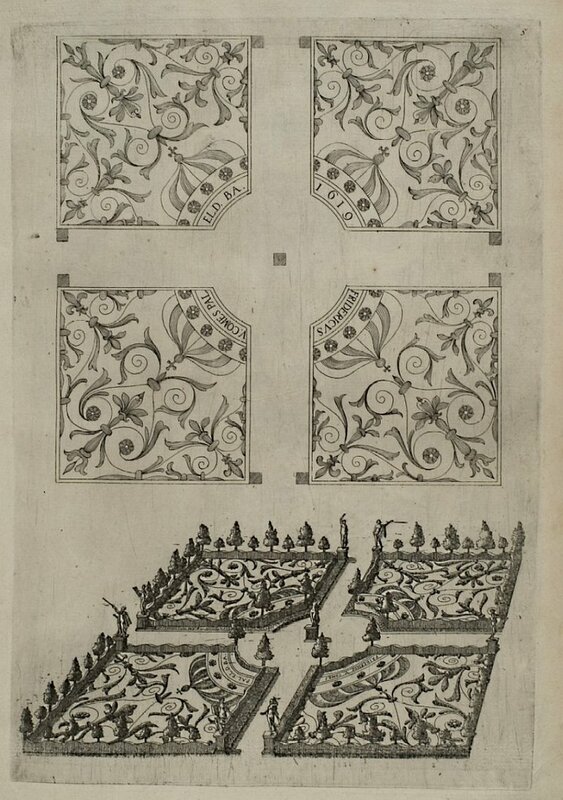 I would love to get a copy of the recently published 'Nature as Model: Salomon de Caus and Early Seventeenth-Century Landscape Design' by Luke Morgan from University of Pennsylvania Press. 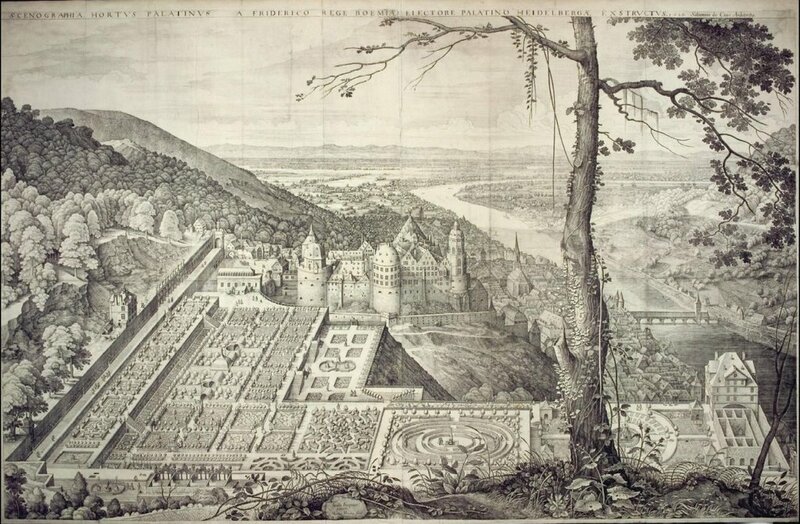 The Schloss and part of its grounds also feature in this engraving of Merian’s. Thanks very much. That's a great picture - I notice the croquet seeing it this time around. It's actually (by far) the best orientating image of the estate. I wonder how much of the artwork (paintings or engravings) of the 'complete' castle/garden are in fact accurate versus imagined anyway, in so far as construction was never finished. I questioned who the artist might be here in this book because I thought the majority of illustrations were a little inferior to that top image. It may just be that this Uni of Heidelberg book is the shabbiest digitized book they have online however (which it is) and it gives a false impression of the engraving quality? Hence, I wouldn't have guessed de Bry was a contributing artist if I'd been put on the spot. Interesting that you say he did. 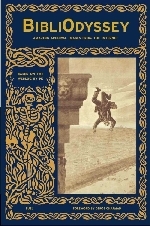 A newly uploaded book on the Schlossgarten at Univ. 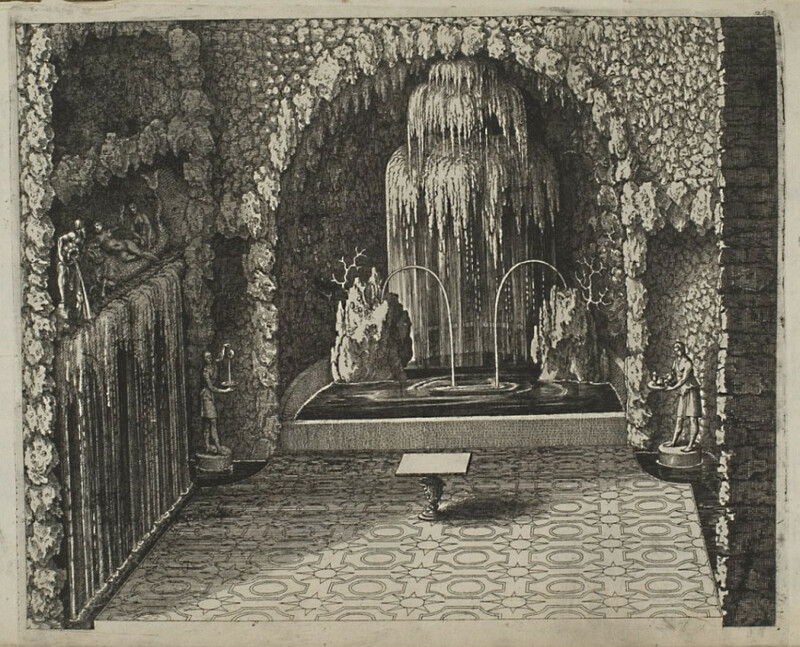 of Heidelberg (Johann Metzger, 1829). And then click links after im Detail on right side. Thanks Jan. I've added the link to the post.